There’s no denying how vegetables are greatly beneficial to a child’s overall health. Even as key providers of Quality Care for Children in Garner, North Carolina, we recognize the value of healthy meals as a way to increase their capacity for learning. However, it’s also a real challenge when our children are picky about veggies. With all the chips and sweets that they see on TV, we can understand how vegetables can be really given lesser attention even more. However, as parents, you can still make vital interventions at home. After all, your voice becomes their voice of influence in their growing up years. Let your influence on consuming healthy food be heard all through their lives. Here are some tips you can let it happen. Our children really follow what we do and say, don’t they? If we want them to eat vegetables and enjoy these, we have to set that example for them. During family meals, make sure that vegetables are always available and that you’re eating them, and enjoying every bite and crunch. When they see you loving your veggies, there’s a higher chance that they want to copy what you did. 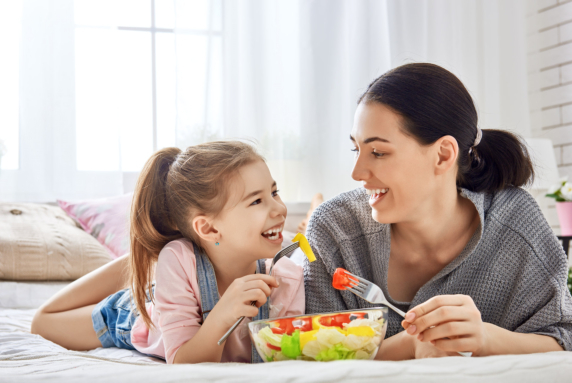 While it’s true that your child may struggle with eating vegetables, you should also give them due recognition for their efforts, especially if they tried successfully. When you appreciate their eating of vegetables, they will begin to see something exciting about this meal. The kind of boost that recognition provides to children is also something we see in their learning progress in our Day Care Center in Garner, NC. Persistence really pays off, indeed, even with eating vegetables. When your child refuses it the first time, it’s alright. Just serve it again, then again, and again. Don’t forget to season your service with gentle reminders and coaxing and you will eventually see your efforts paying off. Thankfully, vegetables can also be eaten as snacks, especially when paired with some tasty dips. Along with yogurt or cheese, try serving sliced carrots or cucumber to your little ones. Having more options with vegetables may open their mind to the tasty (and healthy!) adventure awaiting them. You can also try involving your child in the meal planning and preparation, that is if they’re old enough to do so. Five-year-olds can already be asked to hand you the carrots for you to scrape and slice. These simple activities can also encourage them to eat vegetables since they know they have contributed something to its cooking. How do you find these tips? As a Child Care Centre in Garner, NC, we cheer for you in your effort of building your child up towards what is right and healthy for them. Always keep in mind that our team at Little Believer’s Academy is right behind you when it comes to honing their overall well-being. This entry was posted in Veggies and tagged Child Care, Health Benefit, Healthy Meal. Bookmark the permalink.